As I said, this review is done in the car so I hope the audio and video is watchable! 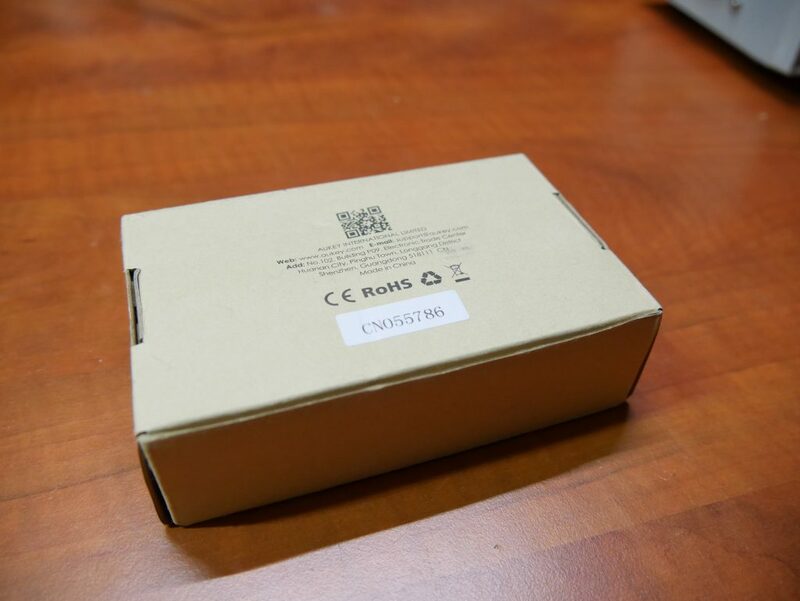 The charger comes in a simple brown cardboard box. There is some text and logo’s on the box though. All in all it looks very clean and functional. 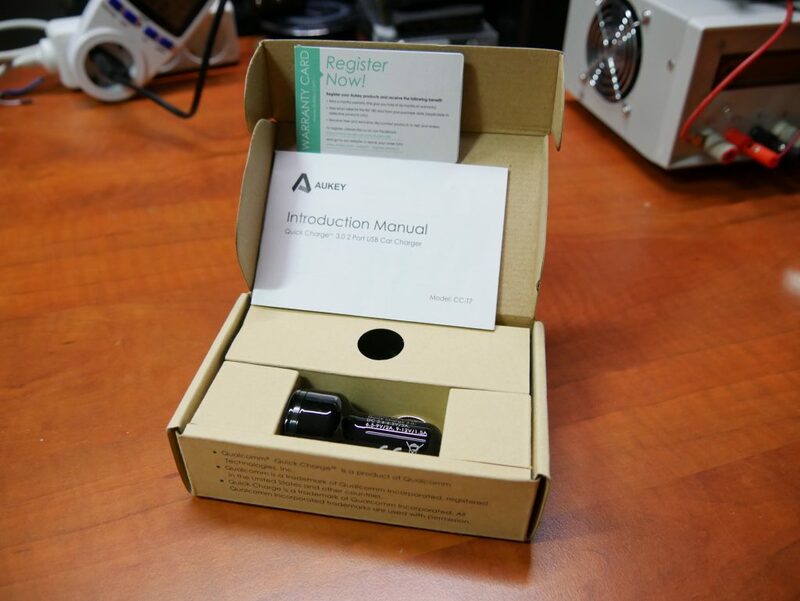 Inside the box you find some booklets, the charger itself and a 3FT (1 meter) Micro-USB cable. It’s a good quality USB cable too, read my review of different brands of USB cables here. I bought this charger on aliexpress where I buy most of my online purchases. You can do so yourself by clicking here. 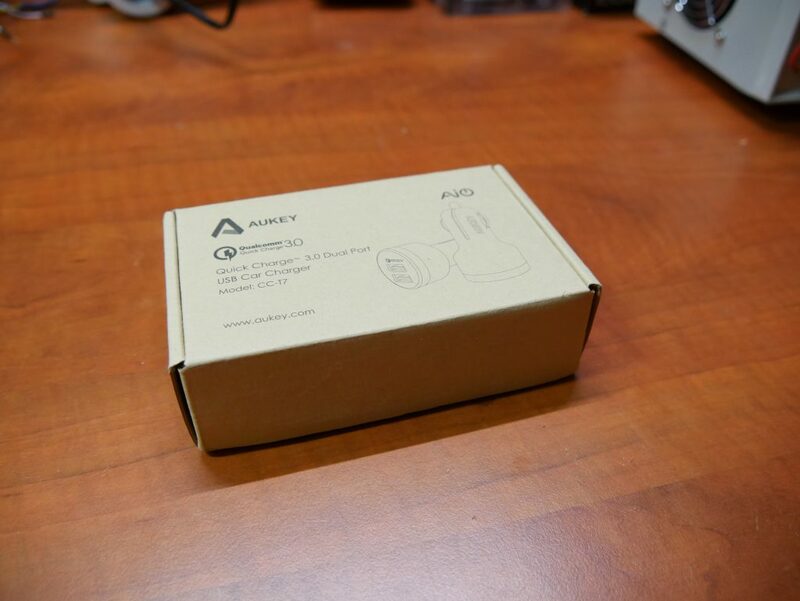 Or take a look at all Aukey has to offer here. That charger itself, it’s slim enough to fit in most sockets without problem. Here you can also clearly see the Quick Charge 3.0 port and the normal port. It’s completely made out of plastic but feels good in hand and makes a sturdy impression. This thing is capable of delivering quite some power! The voltage curve is also VERY good. I’m using the same testing setup as with the other charger tests but for some reason the voltage curve flattens and the voltage stays constant while the amperage still rises. I’ve never seen that before, maybe the charger is compensation for voltage loss when the amperage goes up? I don’t know, but it does deliver very good results. Total amperage cuts off at about 3.7A which is very high, but my charger is able to test up to 4.0A so the charges does shut off the port, just very late. Again a very nice stable voltage curve in the end while amperage rises to about 3.7A and then cuts off. I wonder how much current this car charger is able to supply during the multiple port tests! At 9v we again see a very smooth voltage curve again all the way up to 3.7A. Mind you, combined with the 9v this charger is outputting about 33 watt! Again with the 12v test the voltage remains stable but we do see the amperage reaching a ceiling. The charger doesn’t stop but continues supplying the maximum it can. This ceiling happens around 2.8A meaning that in total the car phone charger was supplying about 33 watt again. That seems to be the maximum the port will output, well above the 18 watt a Quick Charge output has to be able to output so it does very well! Not much difference to be seen. The port behaves the same as if no load was added. If anything the voltage seems to be higher then before! Amperage output is also stable again up to about 3.7A, excellent! During the loaded test of the QC3 port we see no difference with the unloaded test. 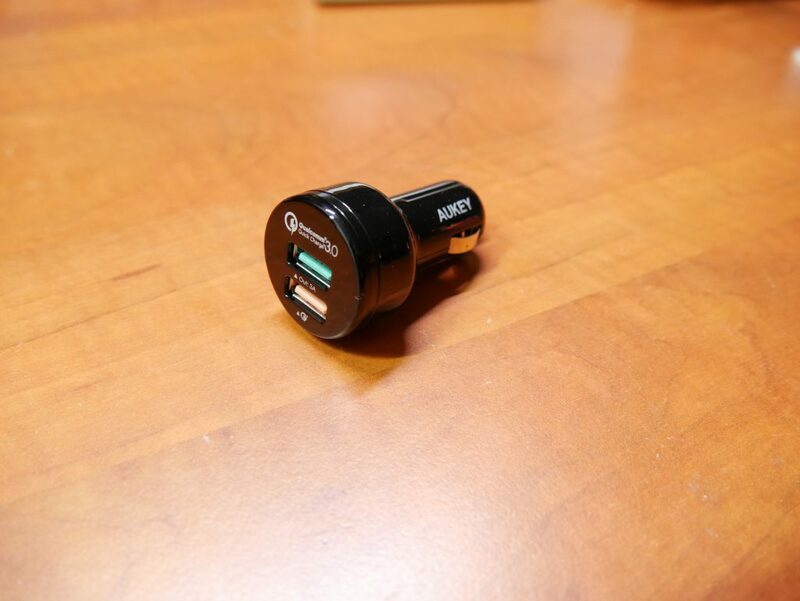 This car charger can output both ports at maximum speed without any issue. The toughest test in my arsenal. 12v output on the Quick Charge port while supplying 5v 2A on the other port at the same time. Here we get to see the maximum the charger can deliver. After about 2.5A the voltage starts to sag to about 11.5v. This is still VERY good though and that much sag can normally be seen in any charger. Quite good. This charger is insane. I’ve never seen a car charger which can output so much power at the same time. Most often they’ve been quite limited. Keep in mind though that your client device will always determine what amperage to draw from the charger, the charger only supplies. So having these ports capable of outputting so much amperage isn’t a problem, it is quite high though. But if you device asks for it, it can probably handle it. The highest amperage mobile device that I know of are some tablets such as the Apple iPAD and some Android or Windows tablets. This charger will supply without fail! Temperature wise you could already see during the video, even after testing the charger for 10 minutes with 2x 5v 2A the charger didn’t even become warm to the touch. What can I say? 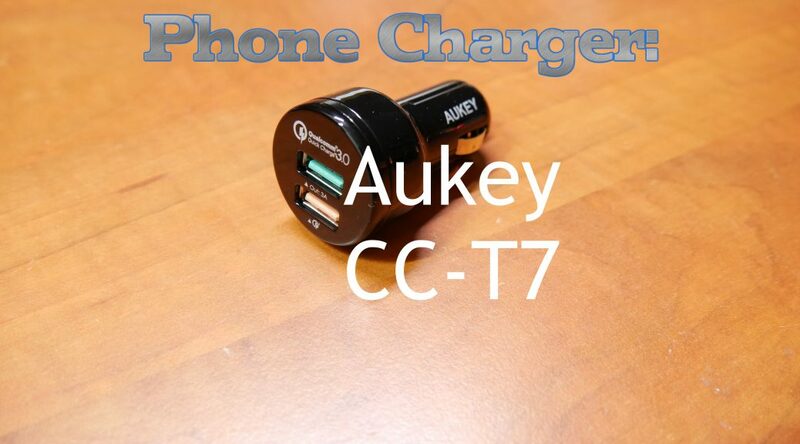 To date, this is definitely the best car charger I’ve ever seen and I highly recommend it! I bought this charger on Aliexpress, you can do so yourself by clicking here. 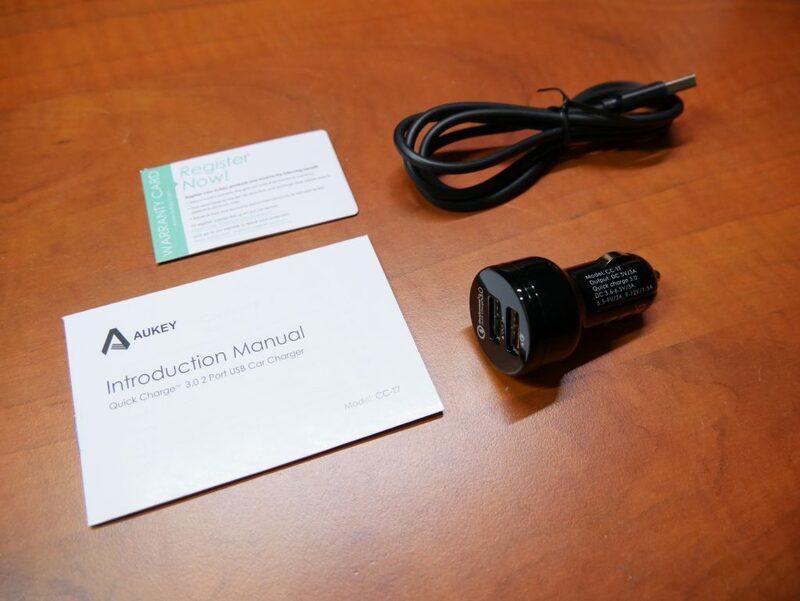 Or take a look at all Aukey has to offer here. Previous PostReview: Orico DUB-12P, 12 port Phone ChargerNext PostXbox One Scorpio vs PS4 Neo, great news for PC gamers!